The Shepley Hotel is a work of contemporary art. The preservation of architectural design is evident in the incandescent glow of the Irish-green SHEPLEY sign, a motif color used in the original 1930’s design of the hotel. 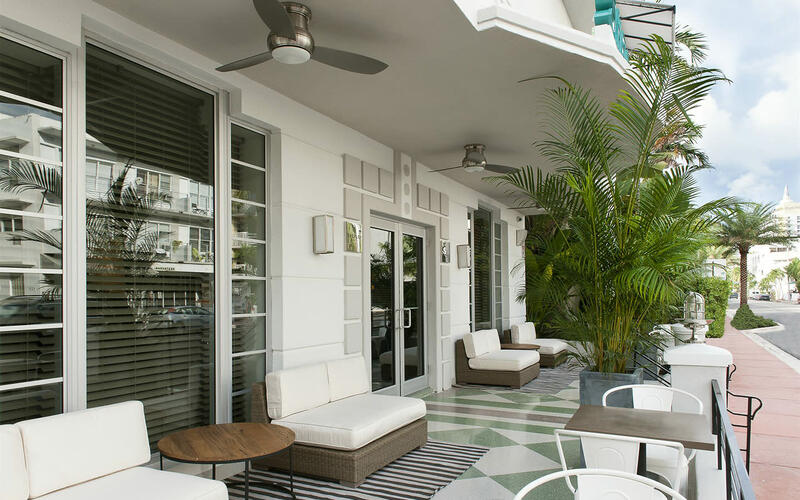 The original green and white terrazzo floors that beautifully grace the front terrace and lobby, are another feature that was preserved from the classic, bygone Art Deco era. Even the hallways are a visual treat with walls encased in burlap and adorned with portraits of a Miami once-upon-a-time; when 1964 convertibles were all the rave and bikinis were coming of age. 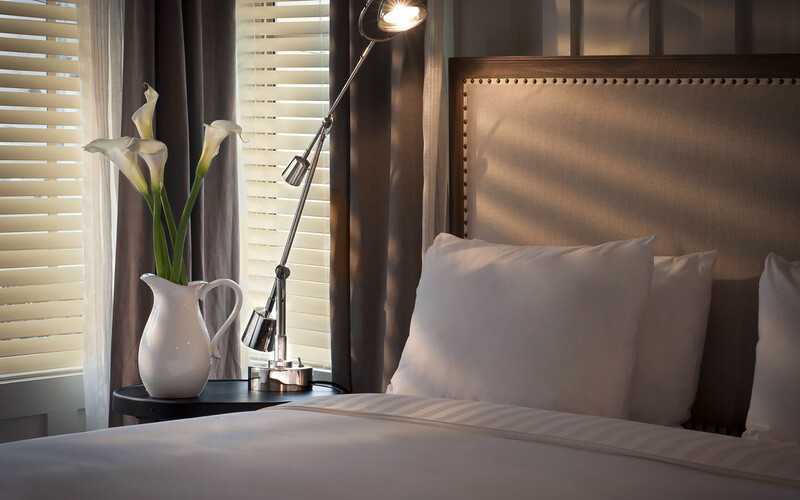 Ambient light sets the mood for a soothing and cozy stay at the Shepley. Drop off your bags with the concierge and take the car to the nearby public lot with ample space — conveniently located and extremely affordable. From its rooms to its amenities to its service, this art deco jewel, designed by Henry Hohauser, provides a memorable stay on legendary Miami Beach. The 29 rooms at the Shepley are reminiscent of a Cabana-style resort. Sunlight bounces off the walls perfectly and highlights the unique décor meticulously fashioned by Argentinian designer Pablo Chiappori. A mixture of past and present, the scorched wooden floors compliment the burlap headboards and Mahogany wood doors and furniture. Antique dressers and chests add to the charm of the room while the flat screen television infuses modernity without taking up too much space. For your convenience, the room also contains a mini-fridge and a safe. The focal point in these rooms are certainly the beds. With a framed portrait reminder, “Do more of what you love”, the "Shepley Full" room is quaint with 2 full-size beds that can accommodate 2-4 guests. Firm mattresses and quality linen thread counts ensure a night of serenity. Black and white checkered floors and porcelain sinks outfit each retro-inspired bathroom, equipped with a rainfall showerhead and hand shower combo for those hard to reach places. Cotton bathrobes and Damana Gentle soaps are supplied by the hotel. The "Shepley Queen" room, with one queen-size bed, offers the same comfort, and the two "Shepley Suites" offer all this and more, including one king-size bed, lounge area, double sinks and a porcelain tub in the bathroom, ideal for a relaxing bubble bath after a day of fun in the sun. The Suite also includes a nice, extra little touch - a coffee maker and coffee. The Shepley, located at 1340 Collins Avenue, sits just one street away from Ocean Drive; close enough to walk to the fun and distant enough to ensure a good night’s rest with minimal noise. The Shepley serves up continental breakfast and delightful customer service every morning from 7am – 9am. Enjoy cereals, pastries, sliced ham and cheese, yogurts, and delicious coffee, orange juice, or tea. Lunch and dinner options are in abundance, from Collins avenue to Ocean Drive. A quick walk from the hotel are five-star restaurants like the Italian cuisine Dolce, or the Spanish inspired Bazaar by Jose Andres. The Pizza Bar is also minutes away for those who love a good slice and a pint. Secured high-speed wifi is available in every room with a code provided at check-in. The hotel can also accommodate document faxing, scanning, and emailing at the designated business desk in the lobby. Staying true to its historic preservation, the scanner/copier is a past-time treasure. If it’s been a while since using a traditional scanner, the front desk will gladly assist! Lush towels and beach chairs are available when you’re ready to put your toes in the sand, for tropical eye-candy and to hit the refreshing waves. Check in with the front desk for these items when ready to play. Forgot to pack something? Directly across the street is a Walgreens convenience store with all the necessary items for a pleasurable stay on the beach, at very affordable prices. It even has a pharmacy if prescription refills become a necessity during your stay. Great Shepley service commences upon booking — information is easily accessible on the Shepley’s website and a phone call will guarantee a live person to assist with any further questions. Once you arrive, staff dressed in soothing tones of green and tan with smiling faces and exotic accents greet you at the door, “Welcome to the Shepley”. Need to find a restaurant or a sight-seeing tour? The front desk is happy to assist with suggestions and reservations. With Art Deco history infused with contemporary style, The Shepley Hotel delivers high-profile treatment with a level of intimacy only found at an exclusive boutique hotel. Share the Love: We'd love to see your photos! Share them with us on Facebook, Twitter or Instagram and don’t forget to use the hashtag: #FoundInMiami.